70840 Welcome to Apocalypseburg revealed! You can view some alternative images on the set details page. Are you impressed with this set? Let us know in the comments. "Dear me, what are those things coming out of her nose?" After seeing the leaked pictures a few weeks ago I was already wondering when the official reveal would be, and it took them a lot longer than I thought. Its a great looking set but I'm not too sure how I feel about the 300$ price. Its a great price for LEGO standards but for a LEGO Movie set I feel like it's not worth it. Especially when you compare the price to the Ninjago Movie D2C's it feels ridiculous, 250$ would've been much more reasonable. I can finally build my Chima Gorilla Planet of the Apes MOC. Also nice Margot Robie Harley Quinn minifigure. Looks like it will have a big sticker sheet. Wow! It looks very impressive! Price seems kinda okay for round about 3,200 pieces. Not sure about this one. The price is very dissappointing for a start considering ninjajgo city's current retail price. Also a missed opportunity to make it modular. Can't quite see where 3200 pieces are used either. If it's this or the rollar coaster I think it's a no brainer. It looks reasonable from a distance but still another high end set from TLMP2 with no idea who the target market is. LEGO 'won' their court case in China against Lepin so now LEGO goes 'Sweet, we can overcharge our fanbase!'. The Corner Garage being $20-30 more than it should be, now this. NinjaGo City has 1700 more pieces for the same price. 1 7 0 0!!!! Also has 7 more minifigures. NinjaGo City Docks has 300 more pieces and 2 more minifigures and is $70 CHEAPER!!! I'll be here waiting for the LEGO fans to defend this outrageous price. I saw this a few weeks back on instagram, its awesome looking very detailed and a stroke of structural genius, lego should of made an upright bigger version of the statue and put the ghostbusters minifigs in it with a Nintendo controller & slime cannons..
Hal jordan and batman look like pirates, 10/10 lego..
No idea why, but this set really appeals to me. It just has an instant wow factor... Not a set I was intending to get, but one that has just made the list ! I'm in! Funny that the shiny chair got it's own picture in the details pics. Scribble Copy will be happy to have such a nice chair to throw around. I love the look of this thing, and the inclusion of Green Lantern and Harley Quinn is kinda cool too. That Harley minifigure is a straight up rendition of her character from Suicide Squad. I'm wondering if all the D2C 2019 sets are $20-30 over the MRP of similarly-sized releases from past years as a result of recolors. Am I allowed to be disappointed at the lack of an ape minifigure? I must say, this looks super cool. I love gritty, ramshackle builds, so this set looks awesome to me. I was hoping it would be a spectacular price per piece like Ninjago City and Ninjago City Docks. That really helps me justify spending hundreds of dollars on it. "Shouldn't you be saving up for a car?" "Forget about that. Look at the price per piece on Ninjago City." Now I'm just hoping for a sale. Way too many stickers for my taste! And the price tag seems also pretty high. This may not be a set that I pick up, BUT I am encouraged by the overall build complexity of an official TLG set and who knows, maybe we're one step closer to a D2C [classic] castle set with a similar advanced design. A boy-at-heart can hope! The price comparisons to Ninjago City show just how ridiculous licensed set prices are! It's also 350USD in Australia, which is...a bit ridiculous. Too pricey, $230 would have been fair. Why does this cost the same as ninjago city but have 1700 less pieces? Not gonna lie, the LEGO movie 2 sets have been pretty disappointing. Mediocre build that are overpriced . It’s a no from me. Epic. Day 1 buy for me! As for the pricing on the 2019 sets, I have a theory that Lego is pricing in the almost immediate 20% discount Amazon, Target and Wal-Mart apply to new sets. I’m not sure it applies here since it’s a D2C, but look at the retail Lego Movie sets. You can find all but two of the sets at 20% off less than a week after the release date. Nice set, but not liking the price. I'm gonna to have to wait (again!) for an acceptable discount. Wonder if Lego will ever put out a set again that I won't feel like a fool for buying just upon release. @vroom.. I dont get you.. are you sh--tting money, have nothing to do (build).. so that you cant wait just like 4-6 weeks to get it at least with 15-20 % discount - somewhere? im really getting so alergic at these Day1-For-Sure-Cries.. If I bought two of them, could I make a full figure statue of liberty model? There is a whole lot of juicy sand green parts in this. The gluttony of $200+ sets Lego is releasing is getting a little old. Everyone's comparing this to Ninjago City, which was very cheap. This is still only 8.8p per piece, which is fairly typical for a set with licenced minifigs, which Ninjago City doesn't have. This would make a great "Haunted House" for a lego theme park. Shame about the price though. It should be more like $250, Ninjago City had over 1000 pieces more and it cost the same. Great set though. Definitely poor in comparison to ninjago city. It's always good to start the year with an incredible set to be released. Looks fantastic. as well as being fantastically overpriced. Not sure where all the comparisons to Ninjago City are coming from… while it’s true that Ninjago City has lots more pieces for the same price, a lot of those are fairly tiny pieces in huge quantities: 319 1x2 tiles, 244 1x2 plates, 125 assorted Technic pins and axles, 110 1x1 plates, 101 1x2 bricks, 89 1x3 bricks, 75 1x3 plates, 71 1x1 bricks, 68 1x1 round plates with hole, 59 1x1 plates with top clip, 49 1x1 quarter circle tiles, 47 1x2 masonry bricks, 48 1x2/2x2 upward brackets, 45 1x2 jumper plates, 44 1x2 plates with end clip, 43 1M bars with clip, 37 1x1 round tiles, 35 1x2 grille plates, 33 1x2 palisade bricks, 32 2x2 corner bricks, 32 minifig heads, 31 2x2 corner plates, 30 1x1 square tiles, 27 1x1 round plates, 25 headlight bricks, 23 1x2x2 window panes, 21 1x3 tiles, 21 1x2/2x2 downward brackets, 21 1x2/1x2 upward brackets, 21 1x1 four petal flowers, 20 1x2 ingot plates, etc. By comparison, this set’s foundation seems to be more heavily constructed from larger bricks and plates, and the statue itself includes lots of large panels, wedges, plates, and slopes in Sand Green. It’s probably fairer to compare it with the price per piece of Metalbeard’s Sea Cow, which included a lot of large Technic panel and ship hull pieces. ^ I believe that people are just comparing it because it is a building (dilapidated or not) from one of the Lego movies. I personally do not think this is a good comparison, but I can see why it is made. I wonder how many of the characters from the other movies (Batman and ninjago) will be in it such as Alfred or Lloyd. Obviously Harley is in it. Where's the "new-for-January-2019 barbed wire"? All I can see is the same old round barbed wire piece. Not as great looking as Ninjago City and much too expensive. I'm in the same boat as a lot of others where I like the look of the set and there's a lot of little Easter eggs to discover but I'm a bit taken aback from the price. While comparisons to Ninjago City are inevitable, I wonder how much using DC Comics licensed characters plays any part in the price tag? I'm actually happy to see that the price in Europe is almost the same throughout the countries, normally Finland gets screwed and pays at least €50 more than the rest of the continent. This is the same price as most of Europe and it looks amazing. I'll get it but I will wait for 2X points. It's definately an attention getter! Can't wait to see Jangs review of this, so Jang if you're reading please do a review! As much as I'd love to build and see this monstrosity in person, I just can't see a place for it in my city. It would look great on a shelf, but something like this begs to be played with. I've spent a lot of time and waaayyy to much money to make my city look nice, completely the opposite of an Apocolypse setting that this would fit into. So in the end unless I stumble upon a pile of money (to also buy extra LEGO space), this will stay on my Wanted List. Remember when the Palace Cinema was revealed, and you began your article with “to no one’s surprise” or something along those lines? Well, this would’ve been another place to throw that in. But @David1985, it's from a movie! It's licensed, ya gotta cover that expensive license! The set is undeniably well done, I honestly thought this was an Ideas submission at first. LEGO truly excels when it comes to their own IP. Makes me wonder why I continue to collect just 1 theme, that after 20 years, is getting oh, soooooo stale? Expensive, small-looking and from a movie which will be a typically underwhelming sequel, IMO. No thanks. Can't we have an Ideas Planet of the Apes instead? Looks like a lot of fun to build, but I'm not sure where I'd put it after that. Seeing as how LEGO reduced The Joker's Manor from £249.99 to £174.99, here's to hoping for a similar repeat or even a sale on Smyths later down the line. Too expensive... Most of us here want this set only for the statue I think, the rest is only stacked containers and random stuff. I like the figures, but for 300€ I would go for Ninjago City, which has more 1700 pieces "only"... Don't hate it, but will not buy it for sure! Also, is there a Snake Plissken minifig? I will buy this with points (in part) and sell the minifigs. Easy peasy. An amazing set but one I will likely avoid (my wallet). Looks amazing. I need all those minifigs. I don't have the room for it though. At least this LEGO statue of liberty has a face. Looks like TLGs’ pricing has finally caught up with our Canadian dollar, so sad as this set looks awesome. Interesting looking set. I'd like to see a few more photos of the interior. A number of the mini figures have a very Mad Max feel to them. Those might be fun to do something with. Must have this. I will MAKE room. Great effort from a building point of view, pretty creative as a set - surely original - and quite an interesting mix between action movie/amusement park and modular themes. And minifigs galore. It's worth the buy (that quote from Planet of the Apes is spot on!) but I'll just have to patiently wait for the sooner-or-later inevitable 30% off on Amazon. I personally used Ninjago City as a comparison because it's another large $300 D2C location based set from an original Lego theme. I can see what you mean about bigger parts though. This does look like it has a lot of them. However, it still feels like it's just less overall than Ninjago City. It doesn't look as big or packed with stuff. ^Batman and DC characters are licensed. It a licensed set. I was not expecting the $300 price tag, nor was I expecting it to be 3100 pieces... so I guess I need to decide if I really want this set. Joker Manor was $280 with 3400 pieces... I got that in a second. I think that'll be yet another price-gouged "No way!" from New Zealand customers. And, indeed, all other non-US customers (if people could actually be bothered to send a message to TLG by simply not buying at non-US ripoff prices). UK price is 20% more than US. NZ price is 35% more than US, 13% more than UK. Definitely outside of my budget, but it does give me the opportunity to go: Where Are My Paaaaaants? Lego has become really greedy these days. Awesome looking set but... how many kids of rich parents does LEGO think there are in the world? Be that as it may, any fan of the Planet of the Apes would find it hard to resist... space permitting! Huh, listed at same base price as Joker Manor in Norway, far less than Cloud City, and “just” 50% up from the modular. Pricey. Oof. Might have to pass based on that. After laying my eyes on this set for the first time and seeing how massive and intricate it is WITHOUT seeing the piece count I thought it would be more than $300 USD and am actually pleasantly surprised. The price/piece ratio is an oversimplified way to look at value and this set is case and point of that. It never ceases to be annoying when people endlessly complain about the price of sets like this that don't rely heavily on tiny pieces. Thank god Lego doesn't put much credence into such complaints or they'd never bother creating epic sets like this. Do you people buy anything but architecture sets? Definitely my kind of bag...but I do agree, some $s too much. This recent trend towards price gouging will in a few years be called the beginning of the second downfall of Lego, if what I hear from Lego fans among my friends and family is anything to go by. Why not price sets reasonably to begin with, so stores aren't forced to offer huge discounts from the get-go to sell the stuff? Comparable in size and parts composition to DD from last year. Less than 4% more parts, 20% price increase. Inflation rate for the last ten years has been negligable, but even if it were 2% per year as the ECB would like, that would mean it's ten times the (imaginary) inflation rate or an increase worth ten years of inflation under normal economic circumstances. And that isn't even a licensed set. Fact of the matter is, Lego has way too many licensed sets, and even if they create their own (like the Unikitty range among others proves), prices go through the roof, at least in non-US territories. Thanks Chief7575, I only read the comments for a review of her face! Great set though. It is interesting to see it rated as 16+ despite containing a lot of large pieces- I can't wait to read a review of the build. @AustinPowers, using the term price gouging is pretty strong. And I can't agree with that at all. You can say it's expensive, but that doesn't mean it's price gouging. Especially for an optional set that nobody is forcing you to buy. I think they're doing quite well, and to say it will be the their downfall in a few years is laughable. Not sure I understand the strength of negative feeling from some folks regarding the price which looks pretty much par for the course given the part count, the number of large elements included and the licence. It looks like a nice set, but it's more playable than displayable and I just can't support this pricing. There are much better sets for the same, or less. I'm a bit shocked that so many people think the set is at least designed well or looks good. I think it looks hideous. Half the Statue of Liberty, okay, that's cool ... and the rest is just piles of random crap, thrown around the joint. There's a lot of stickers and a lot of odd, niche character designs, and I personally just don't get the appeal at all, but that's okay. The price, OTOH? I get there's licensed elements (... that are all owned by WB, but maybe they don't get the characters cheap, even if they're all owned by the same parent company?) but the Unikitty sets (also based around a character from this specific theme) were absurdly, ludicrously expensive as well. And I'd love to hear the explanation for that one, because Lego owns those characters outright. No, I won't be buying this set. I probably wouldn't anyway out of sheer protest. But I find this all really baffling. Great, but what about theD2C of jurassic park!! For once! Would you just Hurry it up Lego or put à release date for cryin out loud !! @DrDave : Have you noticed that all the "negative feeling" is coming from those countries where LEGO's dodgy market-controlling practices mean there's a big mark-up over US/UK prices? The negativity isn't for the set itself but for the fact that the company's bizarre pricing policy effectively means that the rest of the world subsides the US, in particular. Alternatively, you could look at it as a means of restricting the availability (i.e. affordability) of certain sets in certain territories in order to artifically create exclusivity. In effect, their price and market manipulation is playing into the hands of the people who deal in LEGO as a profitable commodity rather than as a pasttime/hobby. Personally, I really don't have a problem with LEGO being expensive - I'm well paid and can afford to drop hundreds of dollars on a set without a thought - but I absolutely will not do that when the pricing is so grossly biased towards the US market. If the product was globally expensive then that would be more acceptable (by virtue of being equally unfair to everyone) - the market would then support that pricing, or not, as the case may be and TLG would soon learn what the market will bear. But as it is, the product is prohibitively expensive in some countries compared to others. With no price parity/equality there comes increasing resentment and it drives people towards Lepin and the other clone brands, whose product quality is now on a par with "genuine" LEGO. There is absoutely no justification for TLG's region-based pricing disparity. And please don't trot out the same old guff about local sales taxes, shipping, blah, blah, blah ... all these are irrelevant as they do not, by any stretch of the imagination, account for price differences that can sometimes hit 50%. I like it, but, oof, the price. Even for my employed adult self, that kind of money for a toy looks overly indulgent. Considering the same funds would also put a good dent in other things I want, I start looking at what ELSE I can get for that much money. Glorious. Just like a MOC and very much look forward to purchasing. The Sea Cow build was like a MoC to me and this seems similar jammed with fun details throughout and loads of great figs. Price is right too. Awesome set, I loved every detail of it. But like every other giant set, it's gonna be a looker for me, sadly not a keeper. @ iron man Santa: that is the correct exchange rate. 75 cents on the dollar! Agree with everyone about the pricing. It looks awesome. Not quite as spectacular as Ninjago City, but in a similar vein to that and the Sea Cow, it's the kind of wacky design the 12-year old version of me would do and that is very cool to see. @Block-n-Roll - actually my impression is that many of the complaints about price are coming from countries like the US, UK and elsewhere in Europe.... Ironic really, as some of those countries get by far the best deal when it comes to LEGO pricing. I do agree however that LEGO fans in New Zealand (and Australia) have genuine cause for complaint - I've long puzzled over LEGO's regional pricing policies and even wrote a piece on it a few years back. I never complain about prices until I can get an accurate weight of the set. Strikes me there would have to be a lot of large structural pieces to hold this together, not just a lot of 1x1 plates or tiles. Besides which, sand green sausages? Sign me up! Equal to $350 in Norway, so you might not complain. Lego: Take my money, this set is far beyond awesome! I'm usually the first to complain about the cost of a set, but given the scale of it, IMO 299.99 is not horrible for the set, as it seems to have a lot going on in it. That being said, Ill still be watching for it on sale. AS much as I want it I try to avoid paying 299.99 or more for a LEGO set. I know I was one of the first to say anything about the price, but the more I see people complain about it the more I want to defend it. I will get this set no matter what the price is. This is an homage to mad max and Planet of the Apes! 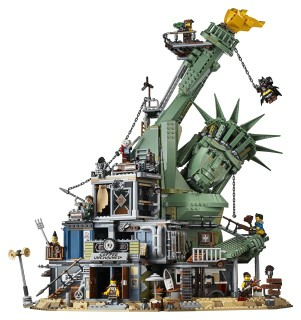 And it’s the best Statue of Liberty Lego has done to date! @AustinPowers; A possible price increase of modular sets has no bearing to whether this set can be considered overpriced. Even if you're right that there was a price increase for modulars, to automatically deduce that the same thing is happening to every Lego set you deem to be high priced is just lazy reasoning. @ DrDaveWatford: I think the emotion is coming from people who simply can't afford sets at this price level no matter how fair the price is. Instead of saying to themselves "oh well, might have to hold off on this" because of lack of funds, they project their disappointment onto Lego and unfairly accuse them of "price gouging". And I agree, this set looks EPIC. the only set I've kept together for more than a couple of years is Metal Beard's Sea Cow, and this set gives the same whimsical impression. @dtobin123: I'm with @Block-n-Roll on this one. I can absolutely afford this set, that isn't the problem. Look at my set list here on Brickset, it certainly isn't short on large (and expensive) sets. My problem is with TLG imho massively overcharging for ever more sets. The recent Modular was just used as an example among many. This set here is the same, as are many others recently: 007 Aston, Rollercoaster, Voltron, Vestas Wind Turbine, most Star Wars sets, Unikitty theme, Superheros, most Technic sets, the list goes on and on. Usually, a PPP ratio of 10 cents per piece can be considered "normal" RRP. PPP ratios under 10 cents are usually the more reasonable sets (or Technic, due to their large amount of pins), the more towards 5 cents per piece you get, the better the deal appears to be. Nowadays you often get sets with PPP ratios of 15 cents and up. That's 50% and more expensive than what can be considered "normal". You can also see it on the page with the Amazon discounts. Quite often recently sets have PPP ratios of more than 10 cents even AFTER 30 to 50% discount. This is a trend, not just an occasional anomaly. If you got 50% more value out of these high priced sets, I guess few would complain. But you still get stickers even on the most expensive sets, instruction manuals the size of old phone directories that are aimed at making sets so stupidly simple to construct that is actually hurts. Pages after pages of adding ONE piece per step, come on, that's ridiculous. That's not added value, that's insulting the intelligence of the kids playing and building with the stuff! And that's not even starting the whole topic of unneccessary parts. Over the holidays I finally managed to build a few sets again with our kids, and there are so many pieces that are completely useless. Pieces that can (and used to) be constructed by using what is already available. A 1x2x2 brick? 1x1x5 brick, Now even a 1x1x3 brick? Honestly. What happened to stacking 1x1 bricks to the necessary height. Are kids incapable of doing that nowadays? And that's just a few of the bricks no one asked for. Of course all these pieces need expensive molding equipment to be constructed. Costs of which have to be payed by the customers in the end. Small wonder everything gets so expensive. Hundreds of highly specialized parts that can hardly be used for more than one purpose not even considered. Don't get me wrong, I have nothing against adding new USEFUL parts that actually do something that couldn't be done before or only with lots of ingenuity and effort. But something like those bricks I mentioned, or a 2x2 tile with two studs on one side, to name just one other example. Yet so many parts that would really be useful are only available through the competition. Like 1x2, 1x4 etc. plates with studs on both sides, or really cool bracket pieces that enable SNOT techniques completely out of the ordinary. You have to resort to COBI, MegaContrux, etc. for those. ^ " Look at my set list here on Brickset, it certainly isn't short on large (and expensive) sets. " It appears your set list (collection) on Brickset is not public. This seems to be a HUGE set. Piece count may not be as big as some, but looking at it, it appears to have a lot of very large pieces and the area it covers and the height are both very big. Love the set too. Once of the best ever to look at. Would love to buy it, but can't see me having the money for a set like this. Anyone else unable to see any pictures other than the first one? Fortunately this set is Not my kind of thing, but I might pick one up at close to 50% off, just for the bricks and figs? @Anachir, because we don’t know the piece content of this set, it’s unfair of you to say this. Obviously, we can all agree that Ninjago city has a lot more small elements but don’t forget it has 1700 more pieces. I’m interested in how they compare in weight. Only then will it be determined. All I will say is this is a VERY INTERESTING AND COOL SET! $0.10/pc has been the expected standard for _FORTY_YEARS_! Gas prices have quadrupled in that same time, and if LEGO prices had risen with inflation this set would cost about $1300.